North Side Story tells the story of U2's earliest days in Dublin. Commissioned from the Hot Press team in Ireland, it covers the formative years from 1978 to 1983, from the first single, 'U23', to the live album, Under A Blood Red Sky. 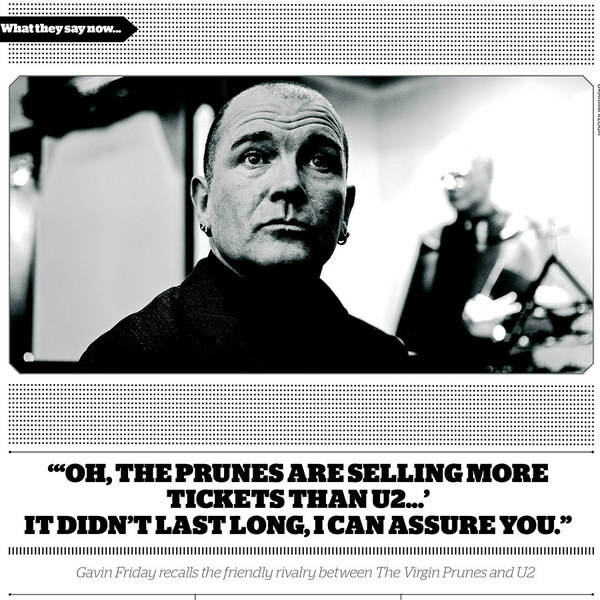 Below, in our latest edited extracts, Gavin Friday, recalls Dublin in the 1970's and how The Virgin Prunes grew up with U2. North Side Story is available with a 2014 U2.com subscription. At 274 pages, this heavyweight book of rare photos, original interviews, diaries, letters and profiles comes with 'North & South Of The River, Wandering In U2's Dublin', a poster-size map charting U2's Dublin. Subscription benefits also include: exclusive music (for example subscribers can now download the song 'Ordinary Love' ); a dedicated subscriber site streaming every U2 track with unique video & archived news; the opportunity to enter ticket presales if the band tour and 25% off your first purchase in our Store. Find out more and get your own copy of North Side Story. (Current subscriber? Click here to renew.) Over to Gavin Friday. 'Dublin in 1978 was a grey, dull, miserable place. It was recession all the way. But you don’t think about things like that when you’re a kid. You don’t know that this is heavy – which it was. As teenagers, the Northside of Dublin was primarily where we hung out. There was this invisible Berlin Wall at O’Connell Street, so Northsiders never really ventured Southside. But punk rock changed that. It created this scene where you’d have to go to show off your clothes or hang out in Advance Records on South King Street. So it was then we started going Southside – and also because gigs were happening over that side of the city. The way I remember it, there was incredible violence in Dublin at the time. I mean, I chose to dress quite flamboyantly from an early age so the amount of beatings I got was incredible, even going down to the bus, never mind when I was in the city centre. It wasn’t just punk rockers or people like that. It was like this sort of time-bomb waiting to go off, like the younger generation had had enough of this old Ireland. It felt like this wasteland. Gangs of bootboys: they weren’t as stylish as the skinheads in their Dr. Martens and their tight jeans; these were just yobs, you know? I remember going to a U2 gig in the Baggot Inn, and this crowd that called themselves the Black Catholics came and started throwing stuff at the stage. I think Bono jumped down and went for them. But I would usually get the hidings. I can’t fight. Verbally I can set a house on fire, but it was always Bono and Guggi that defended me. And there was no money. I’m talking about no money. To go in and see gigs there was always a toss up, ‘Will we walk in and see The Ramones and then we’ll have money to get a bottle of beer and a bag of chips – or do you get the bus?’ It was a penniless city, dull and grey but for me, as a kid, it was David Bowie and then Johnny Lydon that gave this flash of colour. And we joined that club very quickly and then we hung out in town a lot more. Trinity College became a big centre for us because Dik Evans, who is The Edge’s brother, was lead guitarist in The Virgin Prunes, and he had accommodation there. So that became like our hangout: if you missed the bus home there would be six or seven of us sleeping on the floor in Dik’s room. The Buttery in Trinity was quite a vibrant place for gigs. So Trinity was our HQ along with the Coffee Inn. That was a very big meet and greet place, it’s where everyone gathered, and it would be like six slices of bread and chips between four. That’d fill you up. To tell the truth, I was a little bit more advanced than the punks who hung out at Advance Records. A good friend of mine – ‘Tommy the bottle of milk’ we called him – ran the Virgin Prunes fan club. We had a fan club before we even played a gig! His Dad worked in the BNI, which operated the ship route between here and England, so I used to go over on day trips to Liverpool. We’d have a shopping list for all me mates so we’d go over and come back with a load of records as well as getting cool trousers that you couldn’t get in Dublin. There was another quirky thing that very few people know about. At one stage, early on, U2 had a residency in this really bad hotel in Sutton Cross, and they had to do a two-hour set, where they were doing some of their new songs and some covers. And Bono used to be bolloxed and sweating and he’d say, ‘Gav, will you go up?’ and I’d do two Ramones songs, or whatever, with U2 backing me. That was the first time I got up on stage. Gavin has signed a limited number of deluxe editions of his recent album 'catholic', which is available on triple tri-coloured vinyl. Take out a subscription (or renew an existing one) and we'll send you the book. North side story 1978 - 1983, is filled with the inside story of the bands early years. Stuff that I didn't know!!! BRAVO!!!!! U2.com-team. I will treasure this!!!!!! Mine has just arrive!! So beautifull!! Great Book!! Awesome pictures!! I'm sure, the world would never get you.. ask for the castle and run! As a long term Dutch fan (I was present at U2's first concert in NL, October 15, 1980 in Amsterdam. I'm hooked since day 1) I read things here about the start of U2 that I- ofcourse- didn't learn about them in all those 34 years.. It looks like that this is going to be a very interesting and intense book for U2 fans ;-) Thanks GF for sharing!